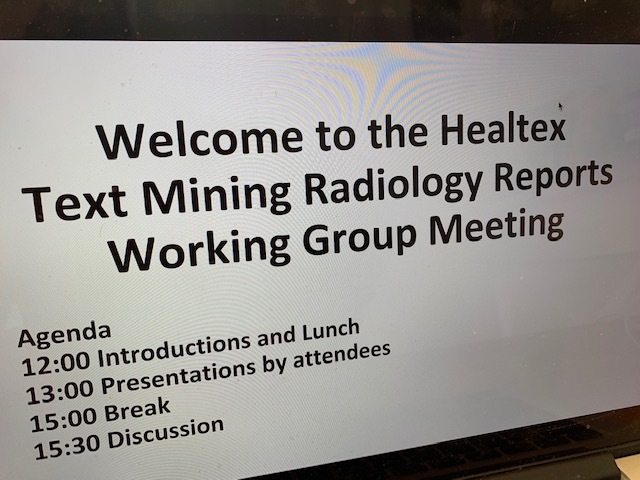 At the beginning of March this year, we held a Healtex working group meeting for Text Mining Radiology Reports in the Bayes Centre in Edinburgh. This was an excellent opportunity to bring together teams with a shared focus on improving health services through a better understanding of radiology reports. All teams brought different insights and thoughts to the table about challenges they face. We discovered that we have a lot of common ground but also differences in the way we process reports or deal with practical issues. The meeting started with several presentations from attendees which gave us a focus for our discussions. 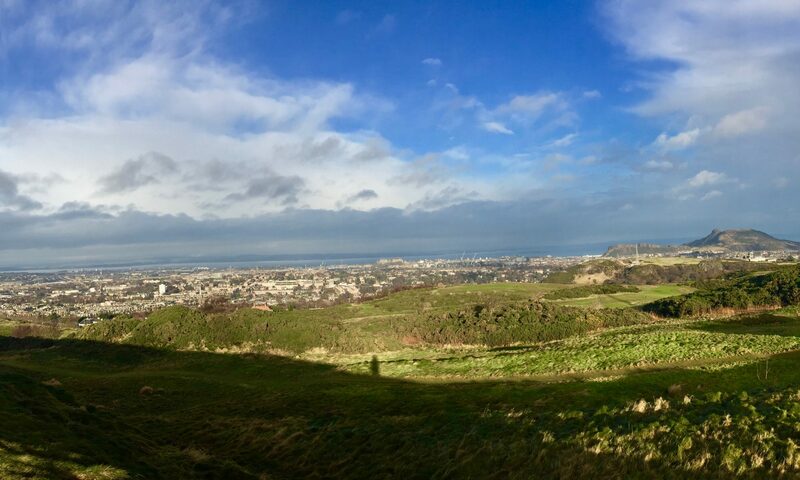 Dr Beatrice Alex, who chaired the meeting, presented ongoing work at the Edinburgh Language Technology Group on text mining brain imaging reports for stroke type and other observations. She presented the EdIE-R system and a comparison of other machine learning methods for the initial step of recognising different types of named entities in brain imaging reports that are part of the Edinburgh Stroke Study (Jackson et al., 2008) and NHS Tayside data. Dr William Whiteley, consultant neurologist, then presented the use case for this work of conducting large-scale epidemiological research using linked data of electronic healthcare records, e.g. Scotland and Generation Scotland wide. Dr Grant Mair, radiologist by profession, provided a lot of useful practical insights into the process of writing radiology reports, summarising observations and the state of technology used in practice (e.g. speech transcription and checking). Dr Honghan Wu, HDR UK Fellow, then presented an overview of SemEHR, a transfer learning system, which he adapted to the same data as processed by EdIE-R.
We also heard from practitioners using text mining and natural language processing for radiology reports and other types of electronic healthcare records. Dr Peter Hall and Dr. Paul Mitchell from the Cancer Research UK Edinburgh Centre talked about their plans to use text mining for processing pathology reports and explained that one of their challenges is anonymisation to avoid accidental disclosure. Dr Adrian Parry-Jones, Honorary Consultant Neurologist at Salford Royal NHS Foundation Trust, introduced the group to a care bundle for clinicians via an app to reduce mortality of stroke patients. He also proposed ways in which text mining could help direct clinical care. We also heard from Dr Ewen Harrison‘s about the work his group is involved in. They applied a rule-based and a deep learning method to identify mentions of gallstones in MRI scan reports. They found the task to be tractable and achieved high scores against a manually code valuation set. Prof Goran Nenadic, Director of the Healtex network, also informed the group about another Healtex working group focussed on data governance which provides guidance on governance and data sharing related issues. As an outcome of our meeting we discussed ways of working together to avoid duplicating our efforts. We agreed to share our code, systems and rules where possible. We also decided to create a mailing list to keep in touch more easily. We also discussed the possibility of a state-of-the-art review on text mining radiology reports. The last comprehensive systematic review of NLP methods and tools supporting practical clinical applications in radiology is that of Pons et al. (2016). Future goals in terms of text mining technology include extending previous models to work for additional target types and types of scans (transfer learning) as well as exploring summarisation (e.g. see Zhang et al., 2018 on summarising findings of radiology reports) and medical language simplification. Members of our working group will attend the HealTAC 2019 conference on 24/25thof April in Cardiff where we will present the goals of this group. We are also widening participation to other groups or individuals in the UK and world-wide. We thank Healtex for funding this event. Jackson, C., Crossland, L., Dennis, M., Wardlaw and J., Sudlow, C. (2008). Assessing the impact of the requirement for explicit consent in a hospital-based stroke study. QJM: Monthly Journal of the Association of Physicians, 101(4), 281–289. Pons, E., Braun, L.M., Hunink, M.M. and Kors, J.A. (2016). Natural language processing in radiology: a systematic review, Radiology, 279, pp. 329-343, https://pubs.rsna.org/doi/10.1148/radiol.16142770.